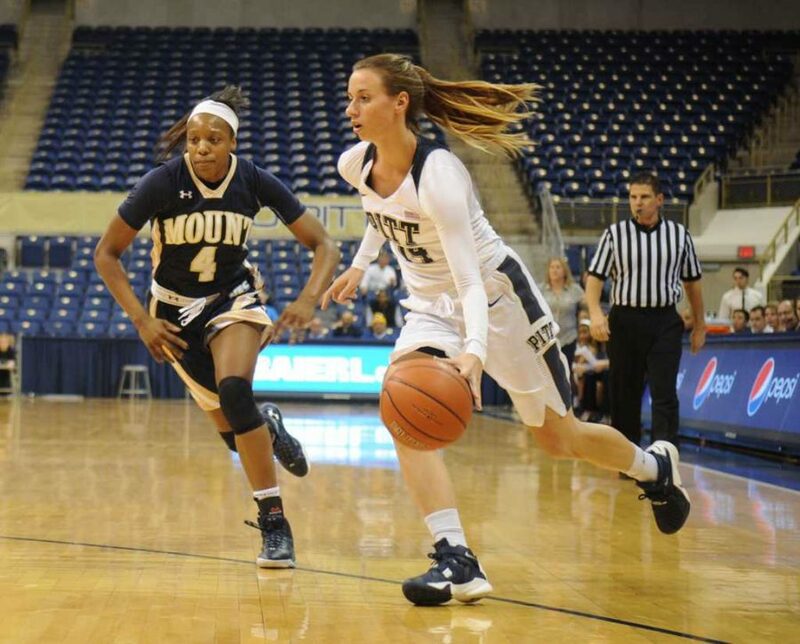 One month and two days after the team’s last win, Pitt women’s basketball guard Fred Potvin was determined to end an eight-game losing streak. Pitt (9-11, 1-6 ACC) picked up its first conference win and first victory since Dec. 22, on the road Sunday, when it knocked off Virginia 58-55. Potvin carried the team with some long-range success, as she shot 5-11 from the 3-point line and scored a career-high 19 points. In the first half alone, the guard shot 5-8 from long, netting all of her 15 points in the half from deep. Her first two hoops came three minutes into the game when back-to-back baskets quickly gave the Panthers an 8-2 lead. After her third long ball, her teammates got in on the action, as consecutive 3-pointers from Stasha Carey and Cassidy Walsh gave the Panthers a 19-6 lead just six minutes into the game. After the hot start, the scoring slowed in the second as neither team scored until 2:23 into the quarter. The Panthers struggled with turnovers in the second period, allowing the Cavaliers within nine. While Pitt led for the entire game, Virginia came within one point with less than two minutes remaining. But some much-needed free throws helped Pitt stay on top. Potvin kick-started her team about six minutes into the quarter, hitting another 3-pointer for the team’s first points in the frame. While Pitt led 25-12 after the first period, both teams combined for only 11 points in the second quarter, and the Panthers led 30-18 at half. The visitors’ long-range prowess kept them ahead — Pitt had 25 turnovers to the home team’s 13. Virginia capitalized on those mistakes, scoring 25 points off giveaways. Still, while Pitt’s offensive stagnation continued into the second half, Virginia picked up its play and cut the deficit to one point. Virginia used a balanced attack — no player scored more than 14 points, and all nine Cavaliers who saw the court scored. Virginia’s Mikayla Venson scored 14, but relied heavily on her foul and three-point shots — shooting 3-14 overall. The guard shot just below her 15.2 per game average, and scored in double digits in 18 of her 20 games this season. The Cavaliers shut Potvin down more successfully in the second half, contributing to Pitt’s dwindling lead — after 15 first-half points, Potvin scored just two in the third quarter. Late in the third quarter, Virginia guard Breyana Mason stole the ball from Aysia Bugg at the top of the key, scoring and cutting Pitt’s lead to just three and forcing Pitt coach Suzie McConnell-Serio to call a timeout. Virginia outscored Pitt 20-9 in the third, so the Panthers took a narrow 39-38 lead into the final quarter. After a 25-point outburst in the opening quarter, Pitt scored just 14 in the following two periods. But Pitt opened up the fourth quarter with a 10-0 run thanks to two layups from Yacine Diop. Virginia answered with a scoring run of its own, outscoring Pitt 7-0 over a one-minute span to cut Pitt’s lead to 54-50 with 1:20 remaining in the game. With 50 seconds remaining, Stasha Carey received the inbounds pass but ran over the Virginia defender, earning an offensive foul call that took her out of the game. Seconds later, Bugg reached in and fouled out as well, sending Lauren Moses to the line. Diop committed a charge after Moses hit one of two shots with 35 seconds left, her team’s sixth turnover in the game’s final three minutes. With eight seconds left, Virginia had a chance for a game-tying 3-pointer. But Venson threw it short, and Pitt left Charlottesville, Virginia, with its first ACC win of the season. Virginia’s 55 points were the second-lowest total that Pitt had allowed in a game since Dec. 20. The Panthers return to the Petersen Events Center next at 7 p.m. Thursday to host Duke.